Suomi NPP satellite image taken of Hurricane Harvey on August 25, 2017 using the VIIRS instrument. Harvey made landfall in Texas as a category 4 hurricane. Image: Data provided by the NOAA Environmental Visualization Laboratory. Hurricane Harvey, the first major hurricane (winds greater than 110mph) to make landfall in the United States since 2005, will go down as one of the wettest storm systems in United States history. Rainfall measured in feet inundated coastal Texas impacting millions. The highest rainfall amount totaled 48.20 inches at a rain gauge on Clear Creek and I-45 near Houston Texas. It was the highest rainfall amount in a single storm for any place in the continental United States. More than 6.7 million people in a 29,000 square mile area (the size of West Virginia) received at least 20 inches of rain in seven days. And a large area east of Houston observed 40 inches of rain. Houston observed two of its wettest five days ever on back to back days August 26 and 27. On August 26, more than 8 inches of rain was recorded. A day later, around 16 inches of rain fell. Two feet of rain fell in just two days! Ranking of the 50 wettest 4-day periods on record at Houston's Hobby Airport. The top four wettest 4-day periods all involve rainfall related to Hurricane Harvey. From August 26-29, 35.6 inches of rain at Houston's Hobby Airport setting the record for wettest 4-day period. It was nearly double the previous pre-Harvey record for 4-day rainfall. NOAA Climate.gov image using data the National Centers for Environmental Information. 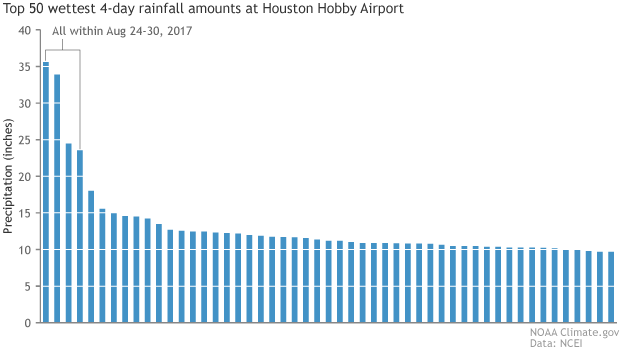 At Houston’s Hobby airport, the three-day rainfall from August 26-28 was larger than the previous record for wettest 65-day period. Three of the airport’s 5 wettest days since 1930 happened during Harvey (August 26, 27, and 28). Not surprisingly, August was the wettest month on record for the city (39.11 inches), more than double the previous wettest month (19.21 inches). The oft-asked question is whether human-caused climate change caused these storms. However, this is the wrong way of looking at it. Climate change reflects a change in the background state in which all weather exists. It does not, by itself, cause hurricanes, but it can certainly make a hurricane’s impacts worse. Climate change can warm the waters which hurricanes use for fuel. Climate change can warm the atmosphere allowing for more moisture to be evaporated and more rain to fall. And climate change can melt land ice and expand ocean waters leading to sea level rise and making it easier for coastal areas to flood. All of these impacts are noted in the most recent report from the Intergovernmental Panel on Climate Change. Or feel free to read through this informative blog at Scientific American from three climate experts.